I love to mix and match my wardrobe. 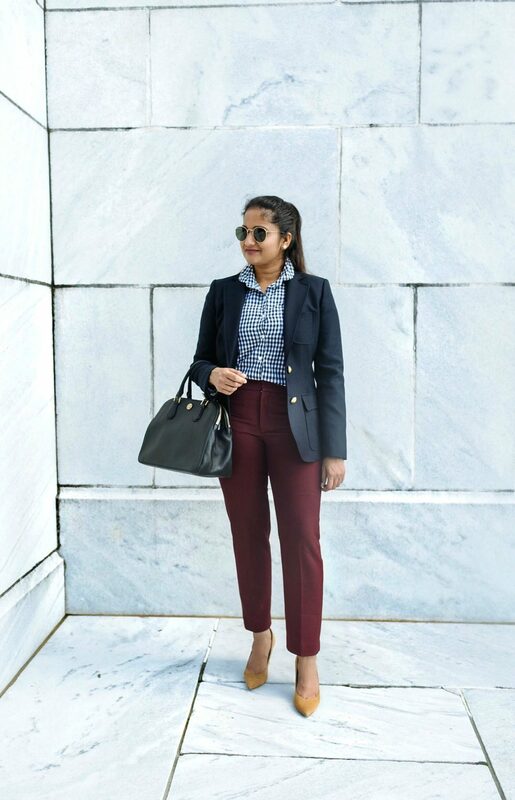 Workwear is where I put in a lot of creativity on a daily basis because I like to keep my work outfits easy, fun and chic. If you follow me on Instagram. 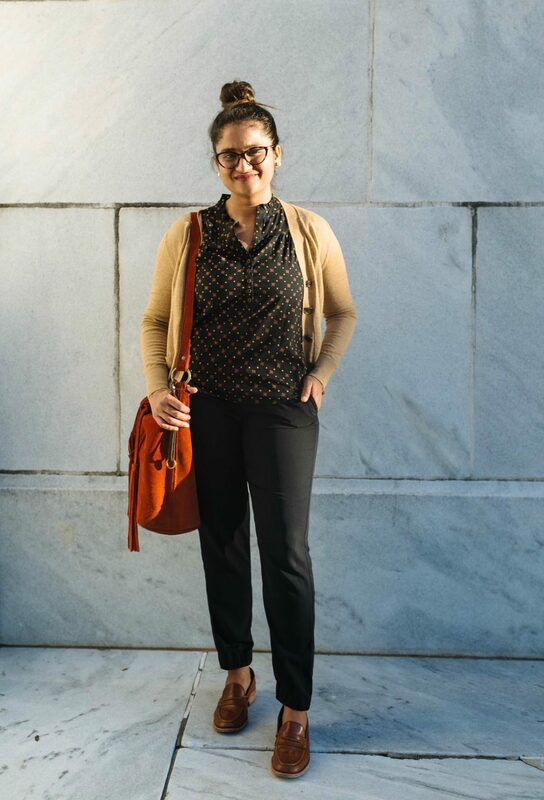 You might already know, I started a new Instagram account @dlworkwear where I share my daily work outfits. Ever since, I have gotten several questions about my favorite trousers, comfortable heels, where to buy cardigans, etc. 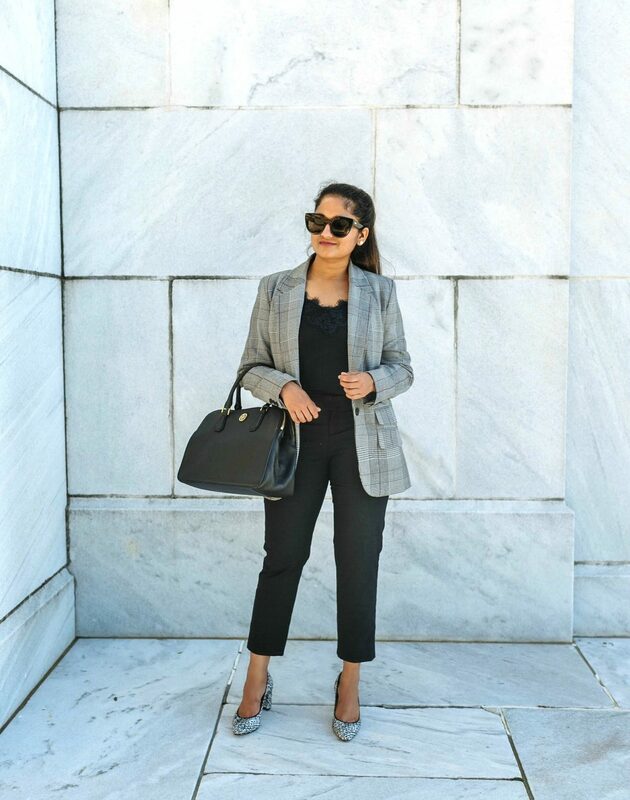 Today in this work outfits for Fall post I am excited to share all my favorite workwear pieces and how I remix them to create new outfits every day. A lot of these pieces, I had them for more than 2 years now like the banana trousers, pumps, the cardigans, and most tops. They’re all really well made and versatile. 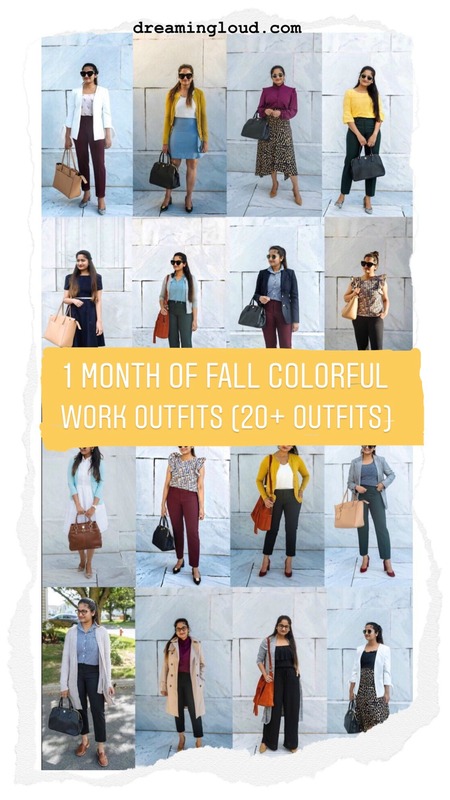 I created this 1 month of Fall inspired work outfits i.e. 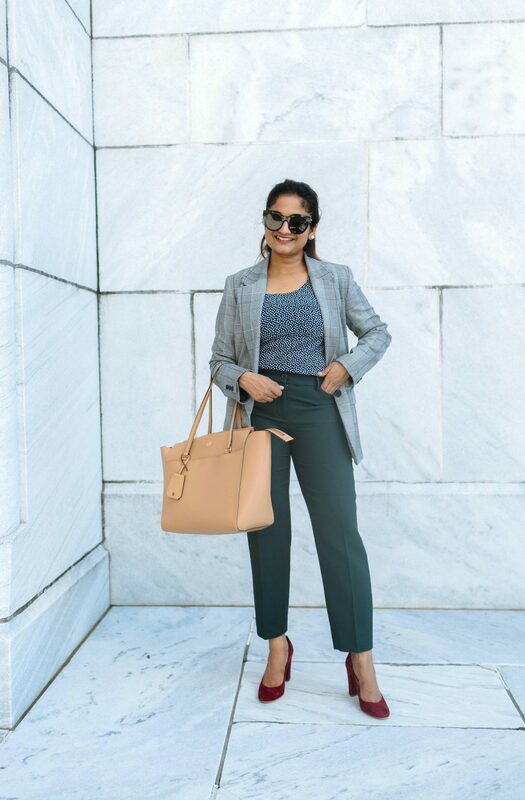 a total of 20 workday outfits (+2 extra) by focusing on putting together a variety of outfits- business formals/boardroom attire, business casuals and casuals (you can replace the joggers with skinny jeans) with the same pieces. 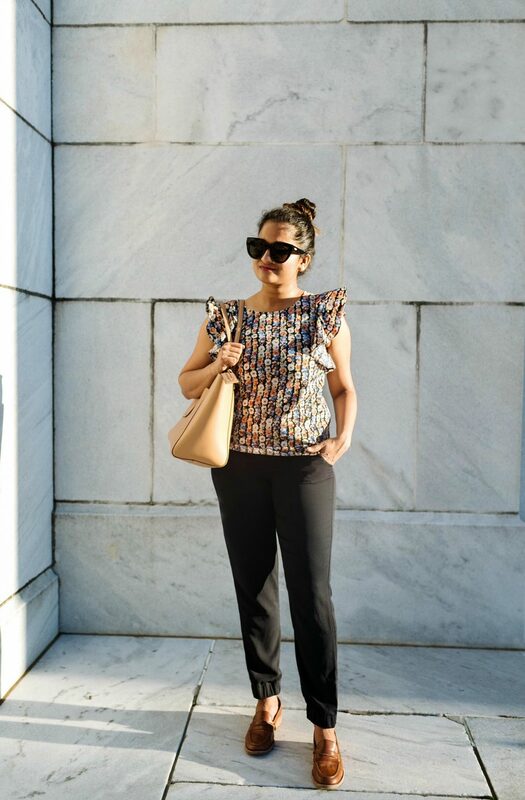 While keeping all outfits colorful, easy and fall appropriate. Some of the trending Fall colors are Yellow, Purple, olive, burgundy, orange, red, teal and prints- leopard print and plaid. Below are all the key pieces featured in the post. I mentioned sizing and fit for every piece. For reference, I am 5’3 tall, mostly size 2R in pants, XS/S in tops, and 4/6 in dresses. Trousers & Skirts– Banana Sloan Pants in black- wearing 2 Regular tts (true to size); the length is smaller even in regular sizing; they are straight legged pants, very comfortable and flattering. 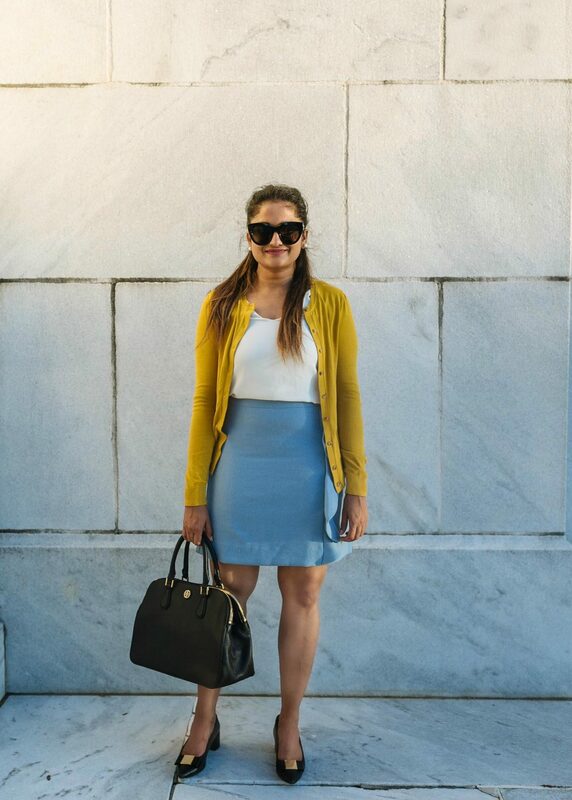 J.Crew Factory Blue Skirt – wearing in size 4 tts, I love the fit and material of J.crew skirts which makes me keep going back to them. 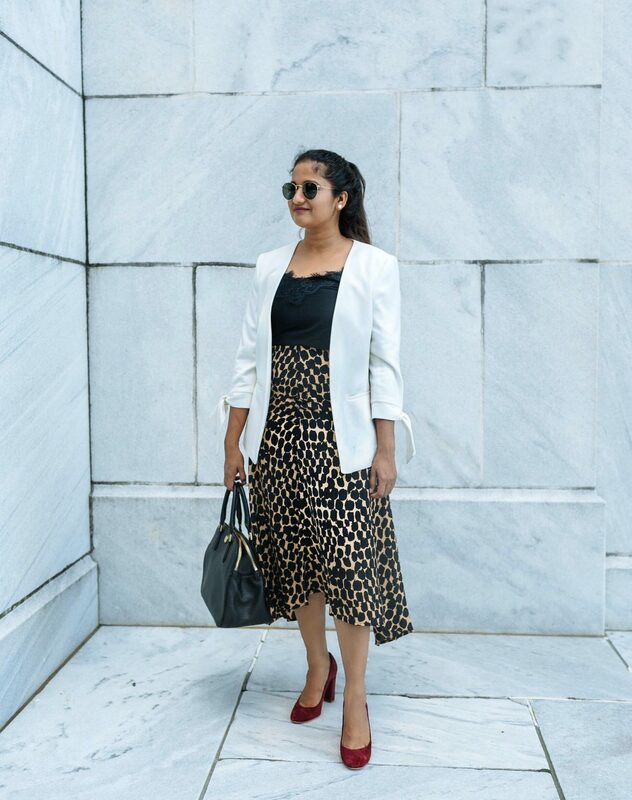 Target Leopard skirt (last seen HERE)- wearing in size 2 tts, the asymmetrical hem on this skirt makes it very fun to wear. 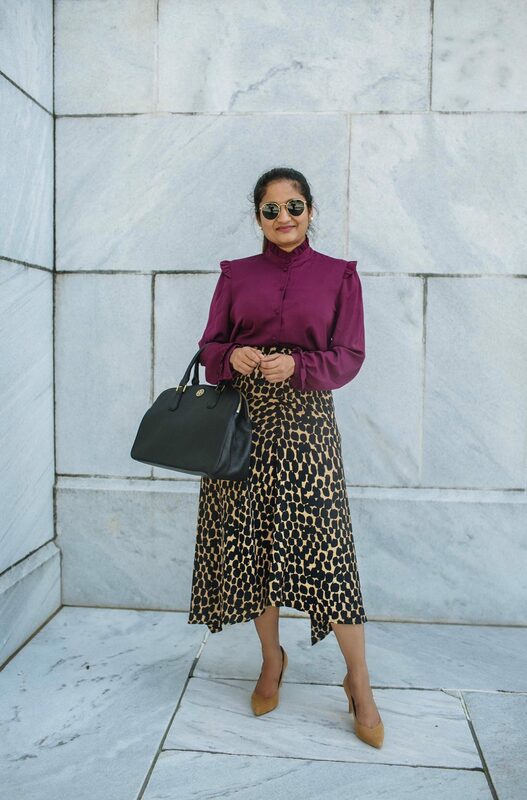 A versatile skirt that can be dressed up and down and the leopard print is trending a lot. 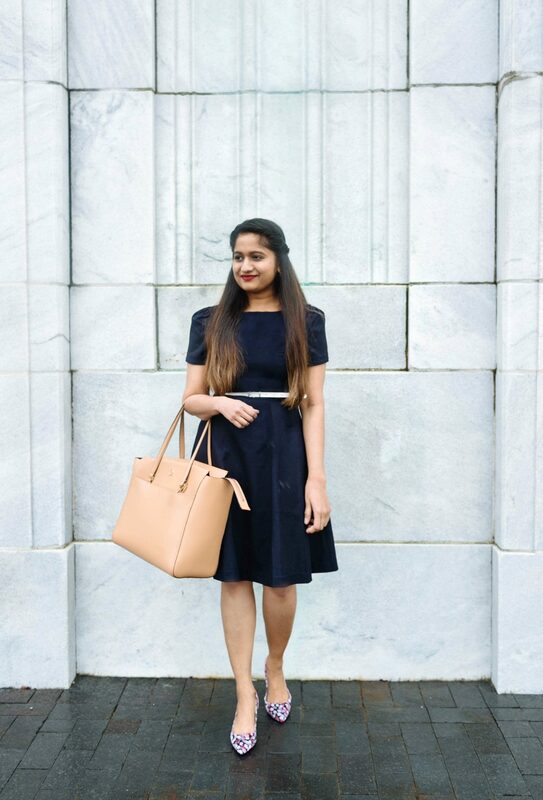 Work dresses on their own, make for an entire look. You don’t need to add anything extra. My go-to styles in dresses for work are A-line dresses, shirtdresses, and fit & flare as they look good on curvy bodies. Everytime I wear a skirt to work, I feel like I dressed up because I almost always wear pants. Skirts are fun but can be challenging to pair sometimes. 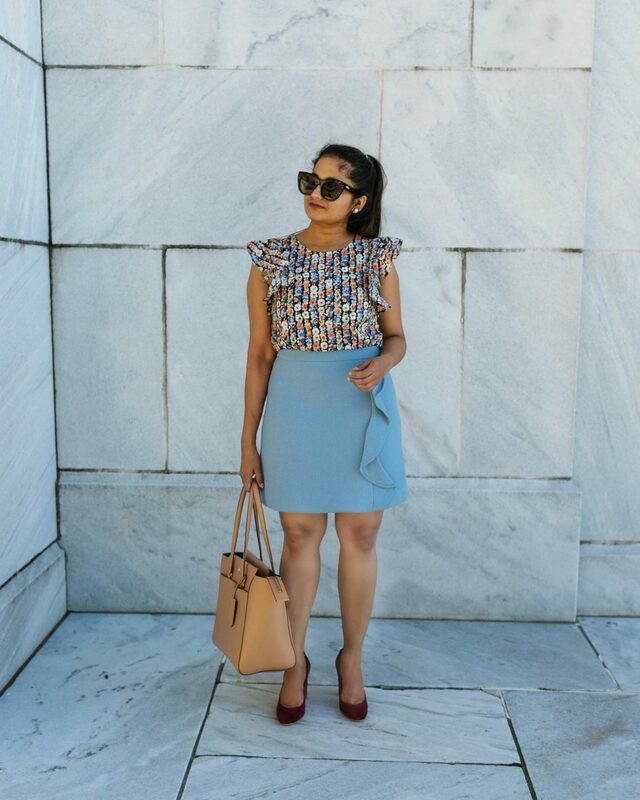 If you are not sure what color to pair with the skirt, always go for the top in the same color family as the skirt. For example, In Outfit #2 I wore a same color floral design top as the skirt. 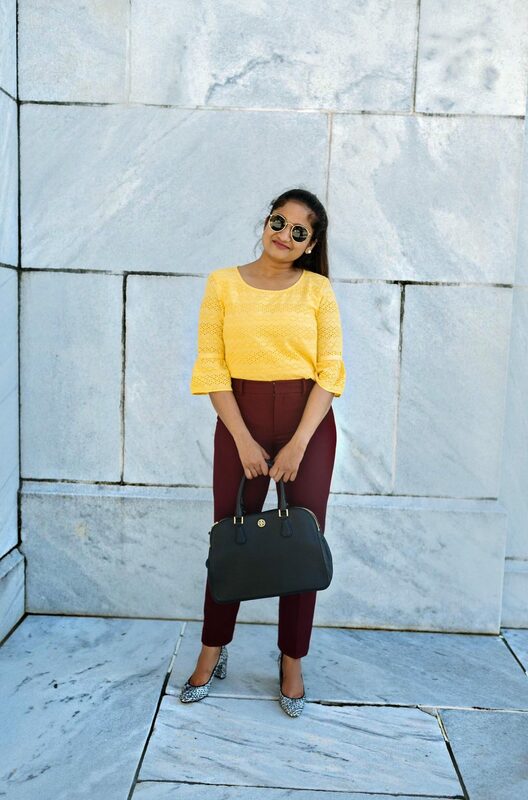 But if you want to add a contrast to your outfit, then go for a complementary color top. In Outfit#1 even though I wore a purple top with leopard print, the whole mood of the outfit is still warm hence it’s not too flashy on the eyes. 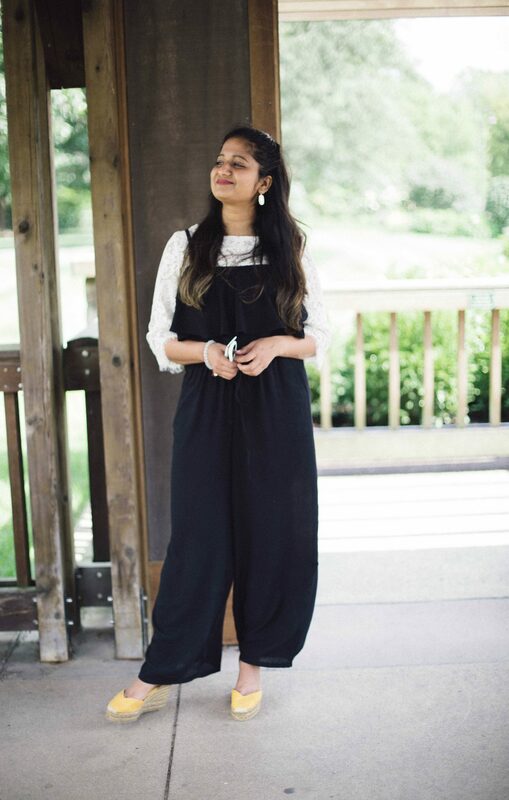 Jumpsuits are another one-piece outfit makers only if you manage to find one with sleeves. 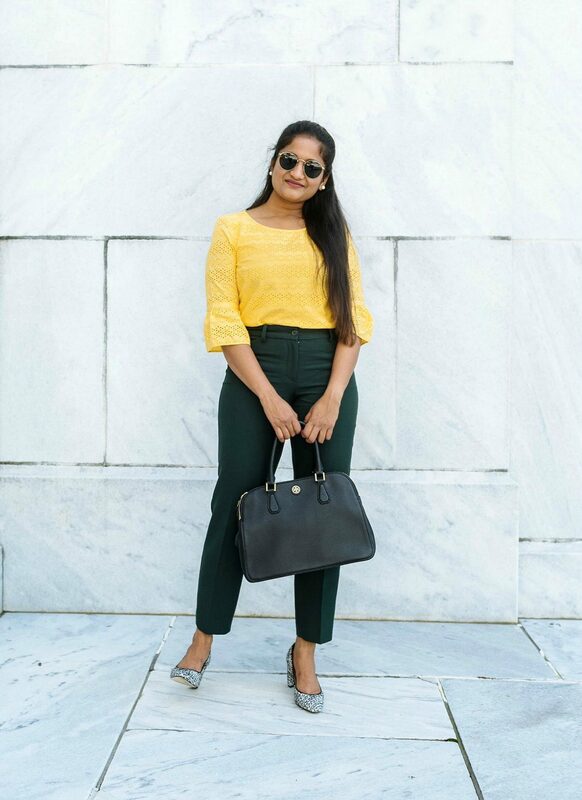 If not, you can wear a lace blouse underneath or pair it with a structured boyfriend blazer for a more formal look or wear it with a long cardigan (scroll down for the outfit) for a casual outfit. This is my go-to style. 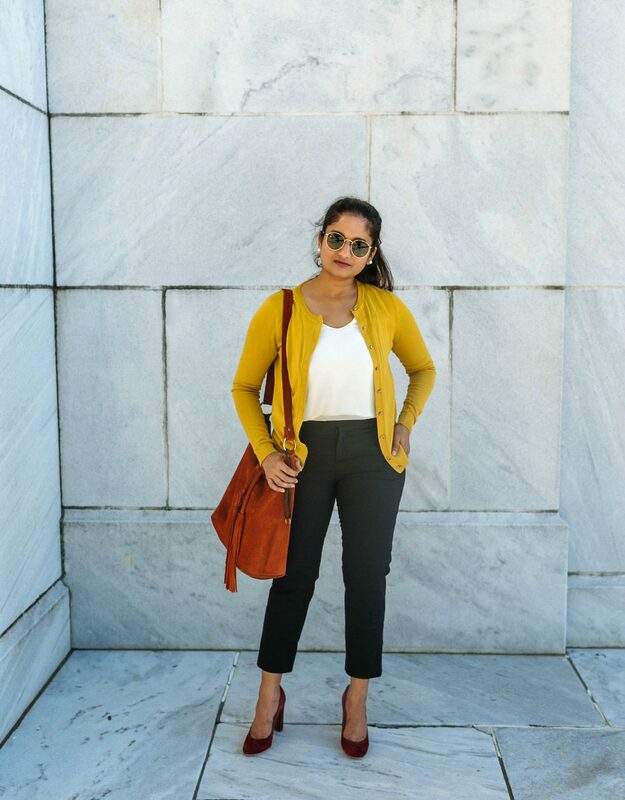 Cardigans are my favorite way to add color to a work outfit. 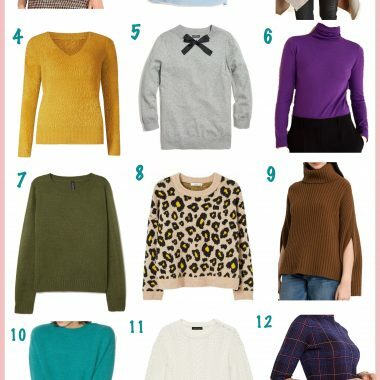 You can wear the same top and bottom for straight 2 days by only switching the cardigan and no one will notice that you wore the same thing as the day before. 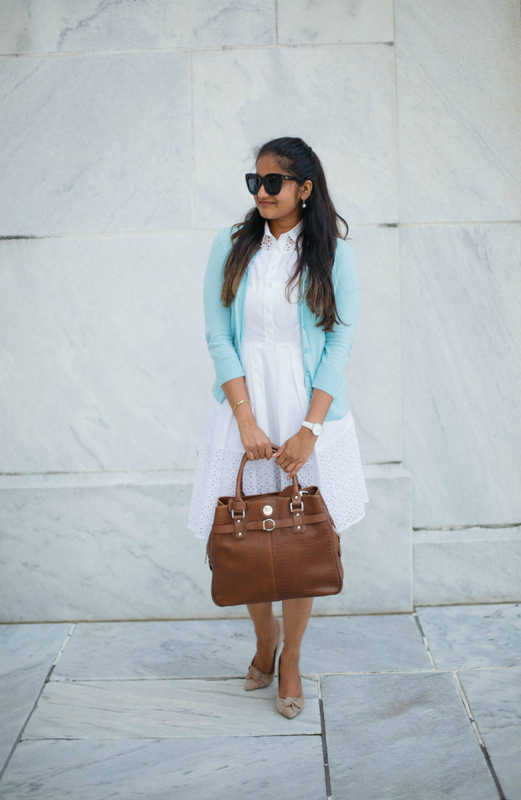 Cardigans are super versatile, you can wear them with jeans on casual Fridays or with dresses and skirts. 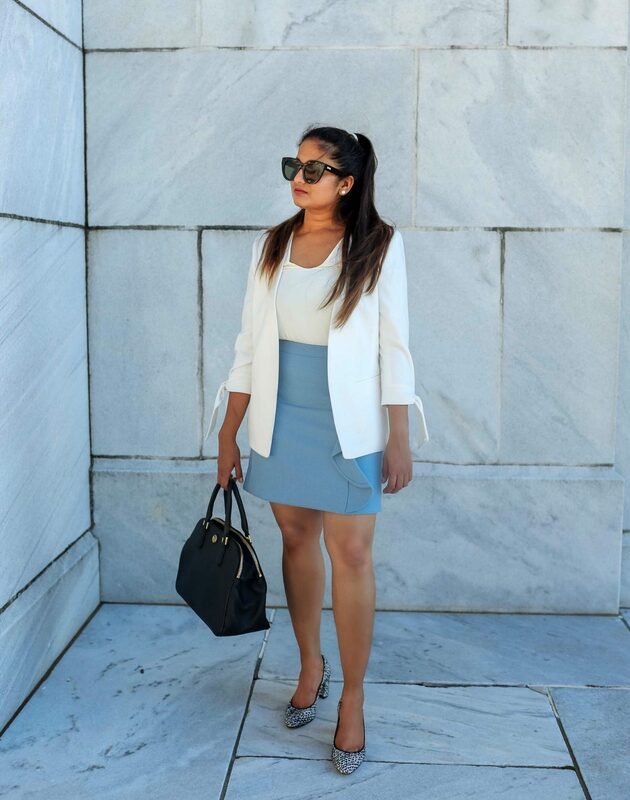 Monochrome is the easiest way to look polished effortlessly. 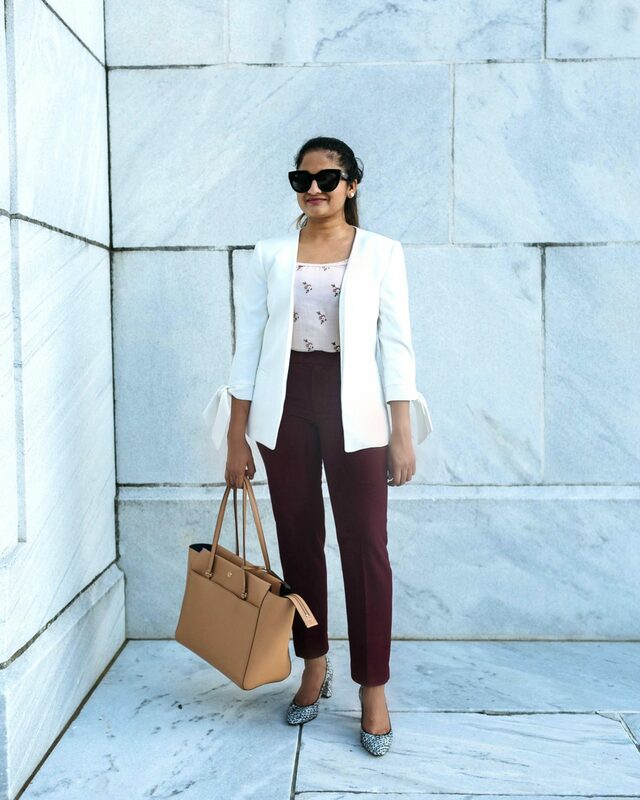 Below I created the monochromatic look in 2 ways, Outfit#1 by matching the top with the bottom and outfit#2 by matching the top with the blazer. 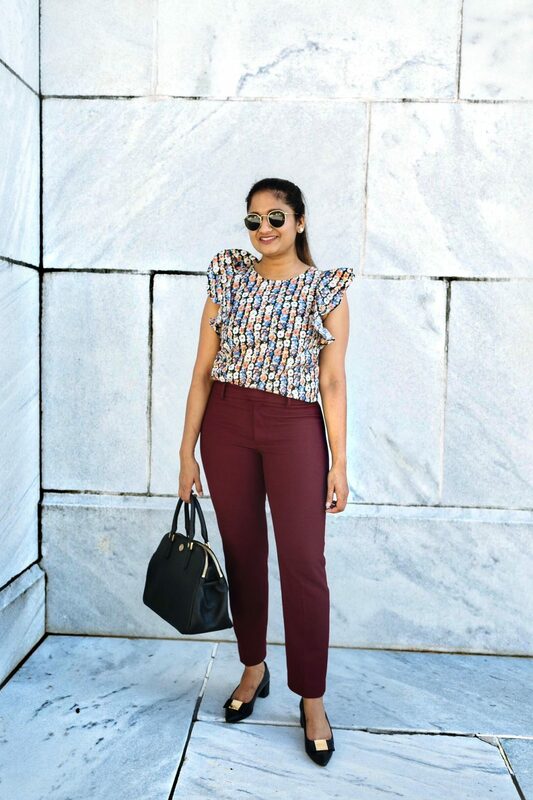 Look efficiently put together by tucking the blouse into the trouser. On days when I don’t feel like tucking in (which is most days) I go for jogger style trousers. They are stylish plus look great with untucked tops and messy buns. 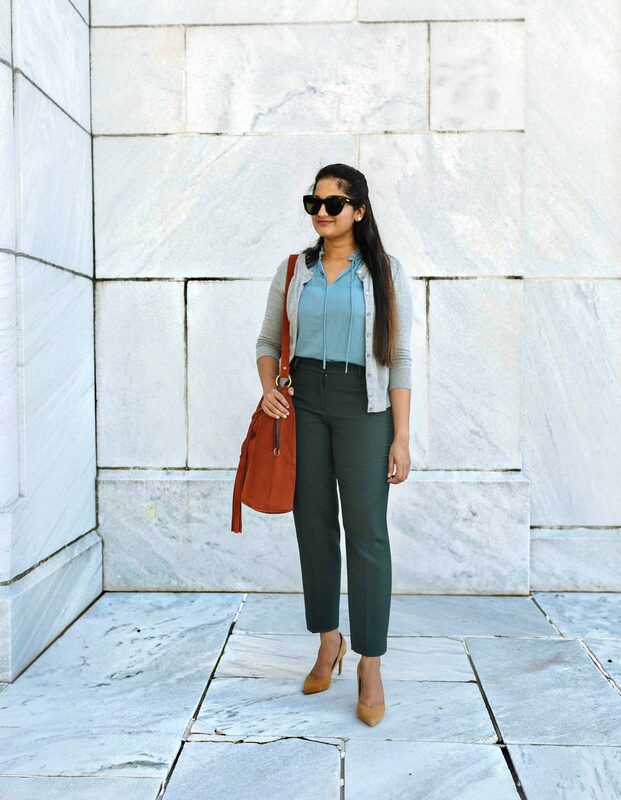 You can dress up joggers easily by wearing them with heels or keep it relaxed by opting for loafers/sneakers. Long cardigans are the cozy way to look stylish. 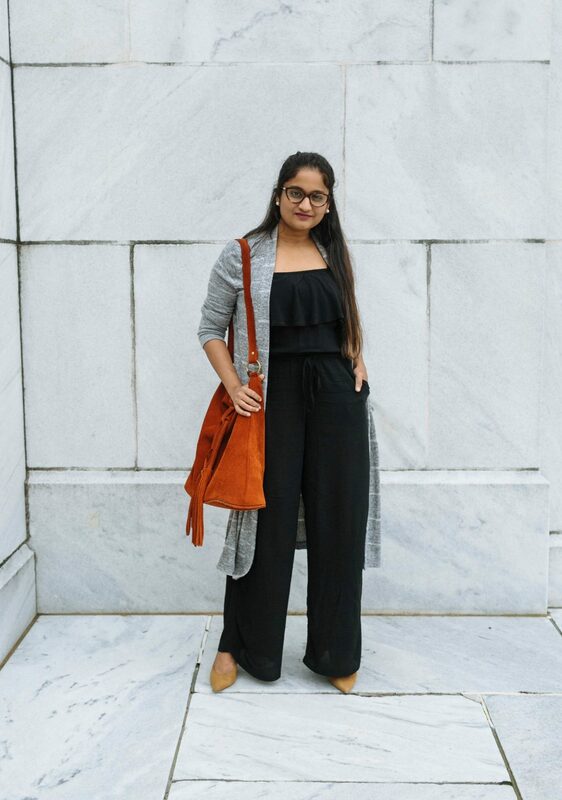 You can create a more elaborate look by pairing the cardigan with a fitted shirt or keep it casual by wearing it over a flare dress or jumpsuit. 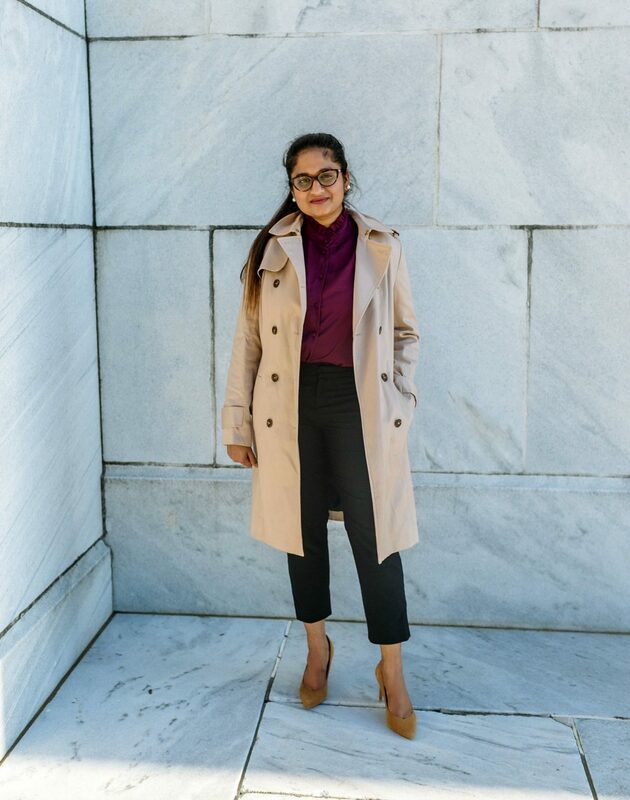 Trenchcoats are the most professional looking coats. They pair really well with all workwear outfits. A huge thank you to my Best Friend Lakki for taking all the pictures. We shot everything in a day and it wasn’t easy. 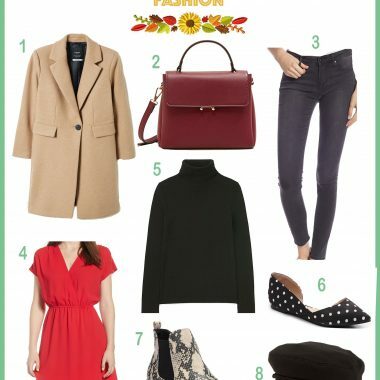 Which Work Outfits are your favorite from this Capsule Wardrobe? Let me know in a comment below!